From love at first sight on a luxurious sleeper train, to James Bond and La-La-Land inspired adventures, the nation’s favourite sweethearts, Kevin and Katie, have enjoyed a whirlwind romance this Christmas, much to the enjoyment of UK audiences. 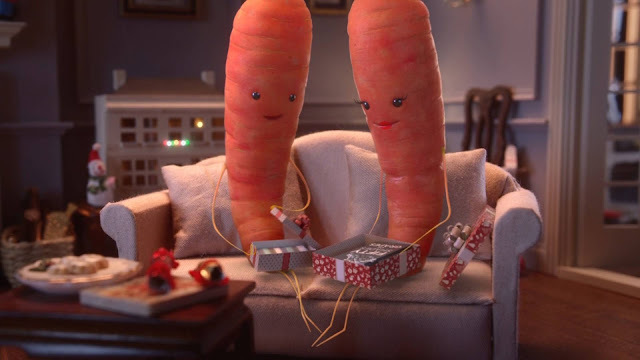 Having captivated TV screens and hearts up and down the country, viewers will be delighted to watch Aldi’s Christmas advert finale on Friday 8th December at 8.45pm on ITV, which will see the magic of Christmas come alive with the arrival of Jasper, Baby Carrot and Chantenay - Kevin and Katie’s children! Adam Zavalis, Marketing Director at Aldi UK, said: “We’re thrilled to see how customers have followed Kevin and Katie’s journey with such anticipation and have taken both characters into their hearts and homes. Growing popularity for Kevin and Katie saw an unprecedented demand for the plush toys, which sold out within a day of going on sale as customers scrambled to get their hands on the must-have toy. Fans will however be excited to know that they can now add to their Kevin and Katie collection with their very own Plush Carrot Kids, available in a pack of three for only £2.99. Proceeds from the sale of the three new carrot kids will support Aldi’s charity partner, Teenage Cancer Trust. Available to buy in stores and online at www.aldi.co.uk/c/specialbuys/toys from 14th December, customers must be quick as demand is expected to be high and as with all Specialbuys, once they’re gone, they’re gone!